We wrote a software to create complex raffle games online. Stores can hand out flyers, with a unique code on them, so that their customers can enter them online and win some prizes. For marketing reasons, we need a simple design to create a raffle for our future customers. 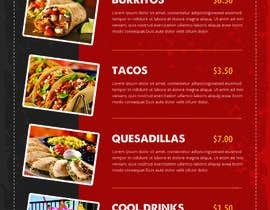 Create a supersized website design (one large background image, no scrolling), which allows foodtruck owners to test our service. There should be a from, some small textboxes etc. A Raffle either focuses on the prize or on a message like "Hey we got a new product, so if you buy ... you get the chance to win ..." etc. Also there should be a flyer. On the flyer there should be the pseudo-locations of the pseudo-foodtruck. Of course, it should have the same message and some related design as the website. Don't forget there needs to be a code printed onto them. Feel free to use any topic related to foodtrucks. So foodtruck owners would be impressed, as they see what you have done. - All pictures need to be delivered, like simple logo, background, etc. we can't open psd, please consider that. - Responsive version would be awesome. - A flyer or even a business card matching the design and message of the raffle. There needs to be a code printed onto it, so keep that in mind.